We are located 15 minutes by car from the Noboribetsu-Higashi Interchange on the expressway and 20 minutes by car from JR Noboribetsu Station. 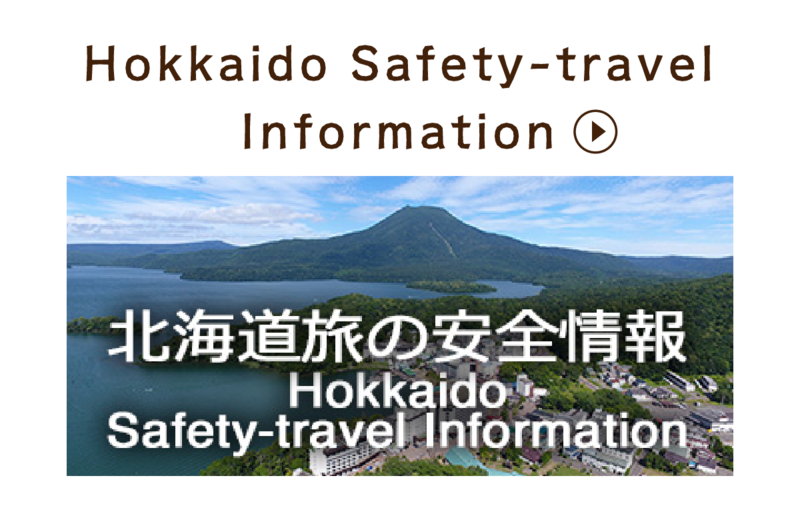 We offer a free shuttle to and from JR Noboribetsu Station. A reservation by the day prior is required. We do not have a full-time shuttle, so note that we may be unable to go pick you up depending on your arrival time. Please tell us your expected arrival time when booking. From New Chitose Airport Station, board the Rapid Airport and disembark at JR Minami-Chitose Station (5 minutes travel time). 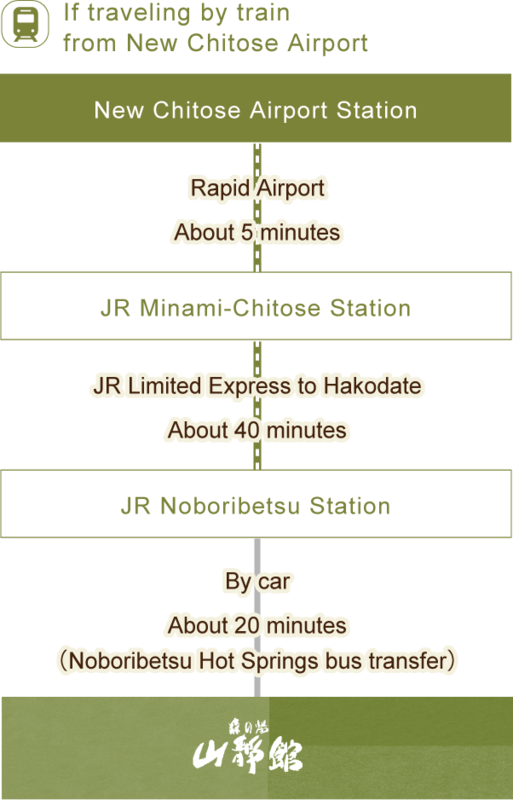 From JR Minami-Chitose Station, board the JR Limited Express to Hakodate and disembark at JR Noboribetsu Station (40 minutes travel time). About 20 minutes by car from JR Noboribetsu Station. Board a Sapporo-bound bus from New Chitose Airport and disembark at Eniwa (20 minutes). Board a Eniwa from highway bus To Muroran and disembark at Noboribetsu (50 minutes). 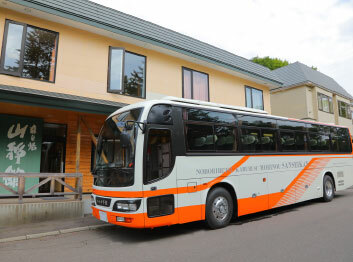 Board a Noboribetsu from Donan Bus To Noboribetsu Hot Springs and disembark at Noboribetsu Hot Springs (20 minutes). About 15 minutes by car from Noboribetsu Hot Springs. From New Chitose Airport, take major roads to Hokkaido Expressway. 5 minutes from there to the Chitose Interchange. From the Chitose Interchange, it is 40 minutes to the Noboribetsu-Higashi Interchange. 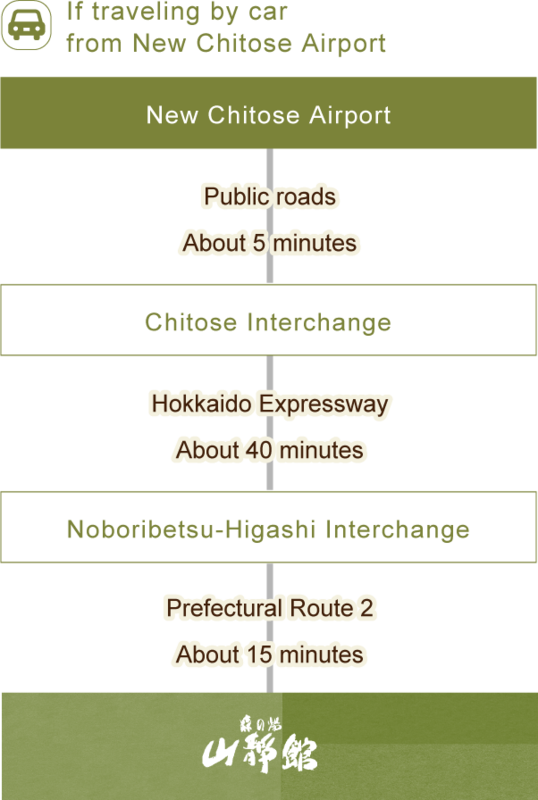 From the Noboribetsu-Higashi Interchange, take Prefectural Route 2 to our inn (15 minutes). 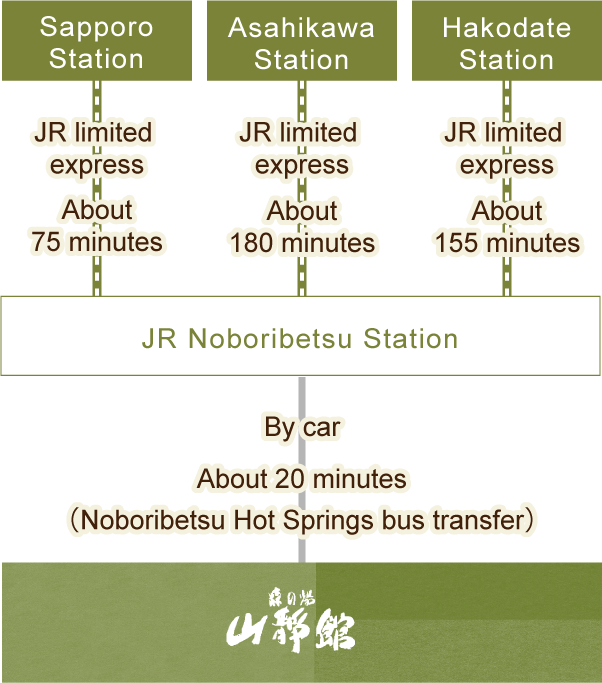 From Sapporo Station, take a JR limited express to Noboribetsu Station (75 minutes). About 20 minutes by car from JR Noboribetsu Station. From Asahikawa Station, take a JR limited express to Noboribetsu Station (180 minutes). About 20 minutes by car from JR Noboribetsu Station. From Hakodate Station, take a JR limited express to Noboribetsu Station (155 minutes). About 20 minutes by car from JR Noboribetsu Station. Take the Sapporo-Kita Interchange off of the Hokkaido Expressway. It is 75 minutes from there to the Noboribetsu-Higashi Interchange. 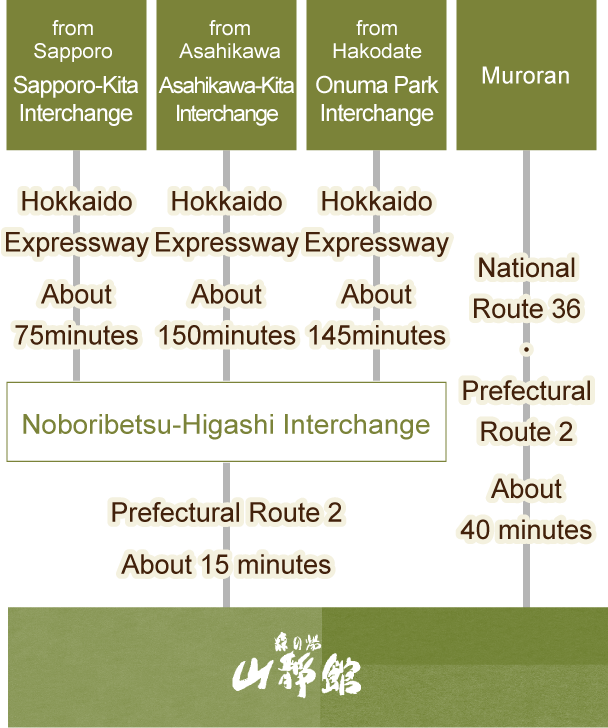 From the Noboribetsu-Higashi Interchange, take Prefectural Route 2 to our inn (15 minutes). Take the Asahikawa-Kita Interchange off of the Hokkaido Expressway. It is 150 minutes from there to the Noboribetsu-Higashi Interchange. From the Noboribetsu-Higashi Interchange, take Prefectural Route 2 to our inn (15 minutes). Take the Onuma Park Interchange off of the Hokkaido Expressway. It is 145 minutes from there to the Noboribetsu-Higashi Interchange. From the Noboribetsu-Higashi Interchange, take Prefectural Route 2 to our inn (15 minutes). National Route 36 from Muroran, take Prefectural Route 2 to our inn (40 minutes).